Author's Note: I added some annotates and links at the end of the article. There is a lot great material on the bucksweep and the Wing-t on the web. In my opinion the Buck Sweep is the Wing-T and the Wing-T is the Buck Sweep. For us, everything starts and ends with the Buck Sweep. The faking, motion, and blocking schemes piggyback on to almost everything we do. We spend a lot of time on the Buck Sweep. If you go on any of the message boards you will hear, “Is installing that play expansive?” In my opinion, the Buck Sweep IS an expensive play. There are a lot of moving parts. When you look at all that goes into the play: the timing of the motion, the footwork and mesh between the fullback and quarterback, the ball carrier learning how to run the play and finally the countless amount of reps the guards need to see every reaction the defense can give you, it is very consuming play. At the National Wing-T Clinic, retired offensive coordinator of Carnegie-Mellon University in Pittsburg, Rich Erdelyi was speaking on new ideas of the Wing-T. He was speaking of how in many ways the Jet Sweep and Rocket Sweep has replaced the Buck Sweep as their flank attack play. I asked the question, then why do you still run it? Coach Erdelyi paused and directly said, “Because I just love the play.” That is how I feel about the Buck Sweep. The Buck Sweep is not the type of play you can just rep a couple of times and expect it to be a decent play. It takes good coaching and LOTS OF REPS. The commitment to the play is why a lot teams that line up in the wing formation and run a hybrid wing offense have stopped running the Buck Sweep. The Jet/Rocket play, once you get the motion and timing down, are much easier to run. Unlike the Buck Sweep, were a majority of the blocks have to hit for a successful play, the Jet/Rocket can find gain yards with only a few key blocks. Even with the complexity of the Buck Sweep, the play has made a big comeback at the highest levels of football. Today's highlights of the Buck Sweep you see on ESPN’s Game Day or Sports Center might not look the way Tubby Raymond and David Nelson at Delaware drew it up in the 1950s, but make no mistake today’s Buck Sweep has its roots in the old Wing-T Offense of yesteryear. Today you will hear the term “Buck Sweep” used to describe any sweep play with two linemen pulling. But, that use of the term is a misnomer. The term “Buck” originates from football coaching legend Glenn Scobey “Pop” Warner’s original Single Wing offense. The term describes a play or action by the fullback where he “bucks’ or smashes in center of the defense front. Coaches old enough to remember, might recall the old Swing Wing “Buck-Lateral” 1 play, where the quarterback would fake the “Buck” to the fullback, than lateral to the tailback for an outside attacking play. “Buck” was used to describe the fake of the fullback up the middle before the QB handed the ball off to the halfback coming across the formation for a sweep to the flank. 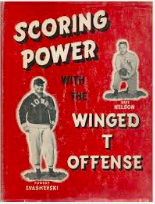 Below is a diagram of the original Buck Sweep drawn in the book Scoring Power with the Winged T Offense, authored by David Nelson, University of Delaware and Forest Evashevski, University of Iowa in 1957. 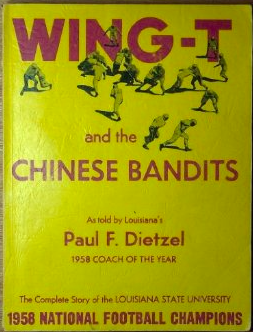 The blocking scheme was later modernized two years later as detailed in LSU’s Coach Paul F. Dietzel’s book Wing-T and the Chinese Bandits published and again in Nelson and Evashevski’s second book The Modern Winged T Playbook published in 1962. Bucksweep as shown the Chinese Bandits 1959. As a young head football coach at Arkansas’s Hughes High School, Gus Malzahn turned to Tubby Raymonds, “Delaware Wing-T: An Order of Football,” and his early offenses ran it “word for word.”4 The roots of the Wing-T are evident in both Malzahn’s Offense at Auburn and Ault’s “Horn” Play. Before we look at modern Buck Sweep, lets take a look at the original Wing-T Buck Sweep. Below is a diagram of the traditional under center Buck Sweep. What separates Auburn’s Buck Sweep from others is the use of the “Sniffer” back. Auburn will place a fullback/tight end type of player to align between the tackle and guard, one yard off the ball. This player will carry out the same blocking responsibilities of the traditional Wing-T wing. The sniffer back would secure the flank by reaching the defensive end, similar to the way the Wing-T wing would block down on the end to secure the point of attack. The split end who is in a reduced split will come inside and block the inside linebacker. The play side guard will pull and kick out the defensive force player and the backside guard would pull through the hole at the point of attack. A more traditional looking Wing-T buck sweep comes from a shot gun look where teams remove a back from the backfield, drop the quarterback four to five yards from the center and add another receiver to the outside; either to the split end side as a slot or to the tight end side as a flanker. In these formations, the quarterback replaces the fullback as the inside running threat and widens the defensive front with the extra receiver. By spreading out the offensive formation it forces the defense to make some decisions. They can no longer load up on the tight end/wing side as is often seen when the offense goes under center. A Shot Gun Wing-T Twins look. A Shot Gun Wing-T look with flanker to tight end side. As the Wing-T was created to create defensive conflicts, the extra receiver and improved running threat of the quarterback creates additional conflicts for the defense. The “Run/Pass Option” or RPO has become almost a staple part of every college team as well as several NFL teams. By putting the quarterback in shot gun, the “RPO” blends nicely with the Wing-T.
Buck Sweep Bubble Read – One of the easier “RPO’s” to run is a bubble screen read off the Buck Sweep. You can run the play as a pre-determined call or have the QB pre-snap read the defensive alignment for a Buck Sweep give or bubble option to the outside. An interesting wrinkle to the blocking of the play is to have the split side tackle release outside to pick up the first outside defender. Bucksweep Comet (Key 3) – The term “Comet” will be familiar to Coach Mazzone’s NZone offense system followers.10 The “Comet” or Key Screen off the orbit or jet motion by the wingback is an interesting concept. The quarterback will pre-snap read the defense for an over adjustment to the motion. If the defense does not react, run the Comet Screen. If the defense adjusts to the motion run the sweep. While it is not a true Buck Sweep with the elimination of the wingbacks block, it can be used as an effective counter away from the motion. Buck Sweep Pop – Another idea borrowed from the Coach Noel Mazzone’s NZone system, is the Shark or Giants concept. This variation of the Buck Sweep is a true “RPO” in that there is three options in the single play call. The quarterback can hand off and run the sweep, throw the bubble or run the POP to the number three receiver to the trips side. This play is very effective in controlling the inside linebacker to the trips side. During the pre-snap read if the quarterback does not like the defensive match up against the bubble he will go directly to the Pop/Sweep Combo. On the snap he will read the inside backer to the trips side. If the backer crosses the center the quarterback will pull and throw the pop to the number three receiver as he runs through the inside linebackers original location. Buck Sweep Read – The shot gun Wing-T has their own version of the zone read. Many teams read the defensive end in the same way zone teams will read the end in their zone read. At the snap, the QB can read the end to see if he squeezes with the tackle as the offensive lineman climbs to block the inside linebacker or instead plays the quarterback. There is also the option having the quarterback read the end, pull, than again read the defensive for a run keep or th bubble screen. Buck Sweep Steal (3 tech) – This play comes directly from Coach Pat Murphy, Capital High School. The defensive tackle in the 3 technique can create an issue for the play. In the traditional under center Buck Sweep, the fullback would be filling backside “A” gap on his fake and the center would protect the front side “A” gap. In the Gun, there is not filling fullback and the 3 technique can a have a free rein to follow the pulling backside guard and cause havoc on the offense. There are two ways you can handle this. One way is to have the backside tackle scoop the 3 technique. The other way is to have the quarterback read that 3 technique. If the 3 technique follows the pulling guard the quarterback pulls the ball and runs a “midline” like type play replacing where the 3 tech vacated. Bucksweep Steal 1 tech – This variation of the play comes from Carnegie Mellon University. Earlier, we mention how the split side tackle will release outside to help block the outside on the bubble screen. After a few releases by the tackle, the defensive end will have to make a decision, will he stay home to hold the quarterback or will he follow the releasing tackle to help defend the bubble screen. Once the end because concerned with the bubble screen it allows the quarterback to read him with the “steal” option off the buck sweep. The 1 technique should be engaged with the center, trying to battle across his face to help with the sweep. The quarterback will read the reaction of the defensive end. If the end follows the release of the tackle the quarterback will pull and run through the “B” gap. 4. You can read about Malzahn’s Wing-T evolution at http://grantland.com/features/gus-malzahn-offensive-evolution/ and http://trojanfootballanalysis.com/?p=576. 6. When I was a young coach, I went to every clinic I could on the Wing-T. 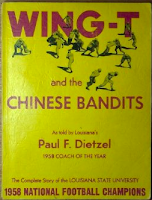 I would sit for hours listening to Tubby Raymond and Ted Kempski on the ins and outs of the Wing-T. At one clinic a Wing-T coach, I believe it was Bill Zwan was almost pleading to the high school coaches, “Get out of the book!” His point was there was more that can be done than that was only outlined in Raymond’s Order of Football. Many coaches, myself included, only did it if Delaware did it! 8. Excellent references to Auburn University’s Buck Sweep.